This time last year, an HGTV crew came to Lakengren to shoot an episode of Lakefront Bargain Hunt for its eighth season. The episode originally aired on April 29, but according to realtor Andrew Gaydosh, it is still available to watch on demand. 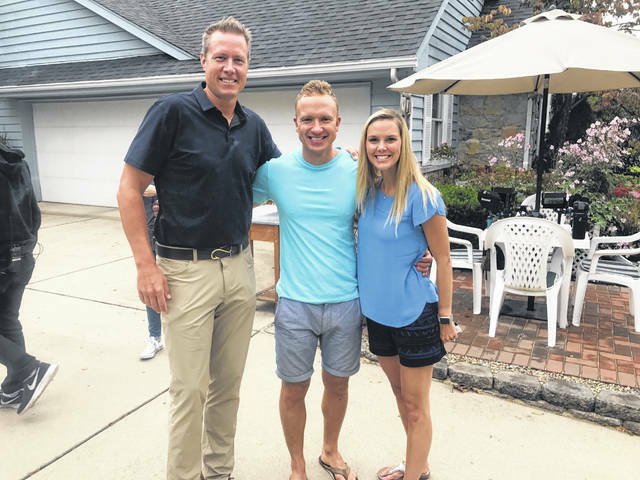 LAKENGREN — This time last year, an HGTV crew visited the private Lakengren community to shoot an episode of Lakefront Bargain Hunt for its eighth season. The episode originally aired on April 29, but according to realtor Andrew Gaydosh, it is still available to watch on demand. The episode follows a young couple from Florida, who wants to spend more time with their family up north, but still wants to live on the water. They decide to look for a vacation home at Lake Lakengren. How did HGTV know about Preble County? Gaydosh had a connection through a previous television show he shot for TruTV. He had pitched Lake Lakengren for Lakefront Bargain Hunt in the past, but to no success. Producers called him up before season eight looking for another pitch and he sold them on the merits of Lakengren. Gaydosh specializes in Lakengren real estate. The couple who starred in the show were referred by her sister, who was a client of Gaydosh. The sister knew the couple was looking for a lake house in the Dayton area and thought Lakengren would be a good fit. “They are a young couple and were probably ideal set up for the show, because they had the time to do it. They both work in the technology field, so they work a lot of hours, but can get off if they need to. It was a five-day shoot and they were able to take that time off of work. They were really excited to do it, were the perfect couple, and I think they did a great job,” Gaydosh said. He added, the entire community of Lake Lakengren and even the City of Eaton were supportive of the filming. They were even able to shoot at the Pork Festival. There were situations when they had to ask neighbors to alter their schedule or plans, so they could get the perfect shot, but everyone in the community was accepting and supportive, Gaydosh said. During filming, the biggest eye-opening experience for Gaydosh was the preparation needed for a half hour show. “I had over 100 releases I had to have signed from homeowners, so I could show images of their homes. I had to have releases for entering the premises and them driving our boats. Whatever we did, we needed a release for it. For every scene that you see, there are four or five different angles to that,” he said. The buzz generated from the show has been huge for business and the Lakengren community in general. Gaydosh now has a waiting list of buyers who are looking to move into the community. Many of them had never heard of Lakengren prior to the show. “I’m promoting it locally to the Cincinnati and Dayton area, but when you get a television program that is nationally broadcasted, you are getting calls from people who never knew it existed,” he said. “You’re getting the national attention that is creating the demand. Gaydosh appreciates the show was able to trust Lakengren had all the amenities they were looking for. He feels blessed to be able to showcase and represent the community in the way he did. https://www.registerherald.com/wp-content/uploads/sites/41/2018/09/web1_IMG_4768.jpgThis time last year, an HGTV crew came to Lakengren to shoot an episode of Lakefront Bargain Hunt for its eighth season. The episode originally aired on April 29, but according to realtor Andrew Gaydosh, it is still available to watch on demand.